Manabi, located in the Coastal region of Ecuador, is one of the top tourist destinations in the country for locals as well as for tourists. First of all, due to its beautiful warm beaches. Manabi is an eldorado for beach lovers and water sport enthusiasts! Furthermore, Manabi is a province full of natural wonders, great activities, towns, history and breathtaking landscapes ready for you to explore. If you are in Manabí I would love to see your pictures. A highway that runs 850 Km along the whole Pacific Coast of Ecuador, including the Manabi province. The Spondylus route, also known as Ruta del Sol or The Sun Route, highlights the spellbinding landscapes, breathtaking beaches, mouth-watering gastronomy and friendly inhabitants of the province. 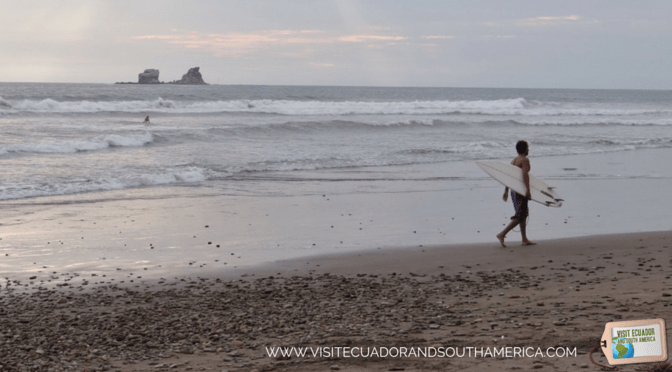 This province is a hotspot for adventure tourism and leisure tourism in Ecuador. You can take surfing lessons, enjoy snorkelling, scuba diving, whale watching, paragliding and many other outdoors activities. Include a visit to the Archeological museum in Manabi, Museo Arqueológico del Banco Central. It provides information about the 7 different pre-hispanic civilizations in the area. In addition, you will get an insight into the history of the province. One of the exhibitions includes archeological fossils, remains of pottery and other items. Furthermore, an interesting fact is that the Jocay territory, which nowadays is the city of Manta served as trading center to the Inca and Manta indigenous groups. From Manta you can opt to visit many attractions including ecological hikes. A 30 minutes drive from the city will bring you to Pacoche Forest. The ecosystem of Pacoche boasts a rich biodiversity, including squirrels, parrots, doves, deers, foxes, snakes and several kinds of birds. During our hike we were able to encounter 10 species of howler monkeys. Local cuisine attracts lots of tourists to this province. There are two main ingredients of Manabi´s gastronomy: peanut and corn. Some of the best food to taste in Manabi include corviche, biche, cazuela manaba, green plantain chips, ceviche, sal pietra, empanadas de verde, alfajores and ayacas. This is definitely one of the best features of this province. Relax or enjoy adventure activities by the sea. Some of the best beaches to visit are Piedra Larga, Ayampe, Los Frailes, Puerto Lopez, together with Playa Murciélago and Tarqui in the city of Manta. In April 2016 Ecuador suffered one of the strongest earthquakes in the history of the country. A 7.8 quake on the Richter scale near Pedernales in the province of Manabí. Ecuadorians are hard workers who want to get back on their feet. So, the best way you can help with the recovering of the province is through tourism. You can help rebuild the affected areas by visiting the province, know that this is an important source of income for Manabi. You can also help buy buying pendants in: www.mysticpendants.com In addition to the 22% of the profits going to Manabi´s earthquake relief, you get nice pendats. Moreover, it is important to know that many areas are not affected by the earthquake, I will mention some of them in this article. – Tour to Isla de la Plata. This island can be reached by boat and is part of Parque Nacional Machalilla. It offers wildlife similar to the one in the Galapagos Islands and is a less expensive option, hence its nickname: “the poor man’s Galapagos”. The city of Manta offers all ranges of accommodation, including hostels, B&B and 5 star hotels. There are excellent options available on the main beaches in the province. Together with my family we really enjoyed Hotel Cabañas Balandra, in Manta. It is ideally located, near the beach “El Murcielago” in the city and not far from Crucita, Los Frailes and Puerto Cayo. They have a lovely pool, gym and sauna. Whether you are coming for leisure or for business to Manta and Manabi, this is a great option. In addition, it is possible to ask for help to book day tours at the front desk. This hotel was not affected by the devestating earthquake. Another great option is to rent homes from local hosts via AirBnB. In addition to renting local unique accommodation and feeling more at home, you can get $38 off your first adventure if you join for free before November. The airport is operational, highways are now open and the beaches are welcoming tourists. So you can book a flight, buy a bus ticket, rent a car and get ready to plan your memorable trip to Manabi. In conclusion, I can positively say that Manabi with its warm beaches, scenic landscapes, its generous people, mouth-watering food and history is a province that you have to visit Ecuador. I’m going to make my way to Ecuador towards the end of the year. I’ll definitely check out the Manabi province. Your list is very convincing. Are hostels and budget accommodations available? I’d love to go on one of those ecological hikes, because they are usually not just a very good workout but also truly interesting and you can learn a lot more about it then when going on a regular hike! Would love to try paragliding. We are always in for some Adventure Travel activities!! It is one of the many fun activities you can enjoy there! You would definitely enjoy this province in Ecuador! The food is scrumptiou! Warm beaches are perfect for water sports, no wetsuits needed! Wouldn’t say no to an ecological hike too, would love to see doves in the wild. Yes, definitely enjoying a warm beach for bathing and water sports is a great option in Manabi! Thank you Anita! There are some really breathtaking beaches and landscapes! Definitely worth the visit! Manabi looks like an amazing area of Ecuador to visit. I had not heard of the ‘poor man’s Galapagos’ before so it will be interesting to do some further research on this option. When choosing a budget friendly destination to admire some of the flora and fauna in the Galapagos, the poor man´s Galapagos is the right option! That is if not possible to visit the islands. Such a diverse selection of activities in Ecuador, it looks incredible — from the food, landscape, animals. Regardless of it being the “poor man’s galapagos” this island looks like the place to be. It is indeed a very diverse country and when it comes to beaches, sun, and food, Manabi is one of the best options! Very good of you to point out the economic benefits of tourism to Ecuador, and to struggling regions in general. Every dollar we spend benefits someone, whether indirectly or directly. I love visiting places that are outside of where people normally go, so that I can contribute and also experience something unique. Thank you John! You are right, we all can contribute and tourism is a great way to help the people affected after the earthake. And look at that Howler monkey too. We saw tons of them deep in the jungles by Bribri in Costa Rica earlier this year. I need to get to Ecuador. My wife visited many years ago and my best friend is American by way of Ecuador. He returns to Quito and a few other towns every 5 years or so. Maybe I’ll join him on his next trip.